Poco Cedillo of Robstown pulled in his “catch of multiple lifetimes” from the back of his pickup truck July 14. 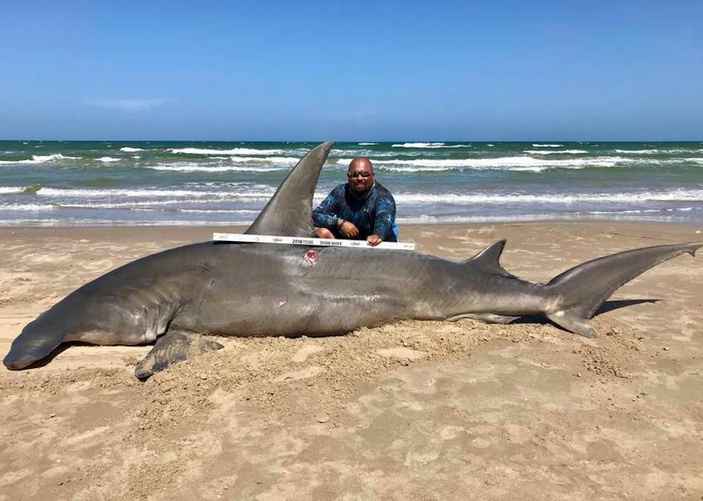 He was surf fishing at Padre Island National Seashore when he landed a 14-foot hammerhead shark, which took an hour and 15 minutes to reel in. Cedillo has caught and released hundreds of sharks over his 20 years of land fishing for these marine mammals, but this one was different. The shark was held in 3-4 feet of water for about 40 minutes before Cedillo and his companions realized it was not going to make it. The group cut about 400 pounds of meat from the estimated 1,000-pound creature and donated it to Good Samaritan Rescue Mission in Corpus Christi. Cedillo wrote the lengthy Facebook post because of criticism received after the death of the shark. He also posted the official measurements, which were taken on land after the shark’s death: length head to tail, 14 feet; fork length, 135 inches; girth, 78 inches. He thanked his friends Timmy Tomlinson, Eddie Outlaw, and Brandon Brezina for their help trying to save the shark. According to news reports, Cedillo used a 12-pound stingray for bait, which he took out by kayak about 500 yards beyond the breakers to drop. After sitting idle for four hours, the giant hammerhead hit at around 4 p.m. Saturday, July 14. Adult hammerheads are usually 13-20 feet long and can weigh 500-1,000 pounds. They are carnivores who feed mostly on stingrays. Their wide, mallet-shaped heads are lined with highly specialized sensory organs to allow them to scan the ocean floor to find their favorite meals hidden under the sand. Hammerheads can live 20-30 years in the wild. Most hammerheads are much smaller than the one landed by Cedillo. While the bigger sharks can be deadly, they are considered mostly harmless when it comes to humans.